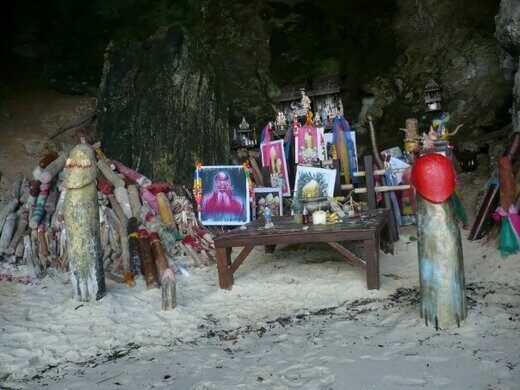 On the edge of Phra Nang Beach in the Krabi Province of Thailand, a cave has been dedicated to a princess goddess named Phra Nang. 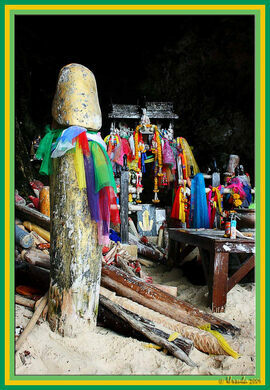 Today, local fisherman and boatmen leave offerings in Phra Nang cave to ensure safe travel on the sea. These offers take the form of male genitalia - the cave is covered in many “linga”, or phallic-shaped statues meant to represent the Hindu god Shiva. The offerings in Phra Nang cave are especially realistic - the penises have discernible ridges and heads. They are decorated with colorful cloth, and the cave is filled with incense. A boat is necessary to reach Phra Nang Beach. A boat trip from most of the local beaches in Krabi will cost 100 baht and take about 10 minutes. Phra Nang Beach is located a short walk from Rayavadee Resort.